To be very frank, being an editor/writer in the firearms industry can sometimes have its perks. Sure, it’s not all fun and games with the constant pressure of deadlines and all the other sundry details involved in producing magazines and web content, but it certainly can have its good moments! A perfect example of this happened recently when I received an invitation to a writer’s event at SIG Sauer in Exeter, N.H. 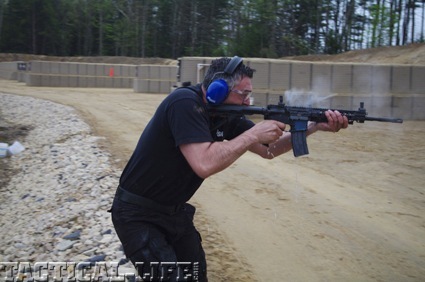 Upon my arrival at SIG Sauer, a group of writers and I were taken to the SIG Sauer Academy’s ranges to try out a selection of the company’s pistols and rifles. 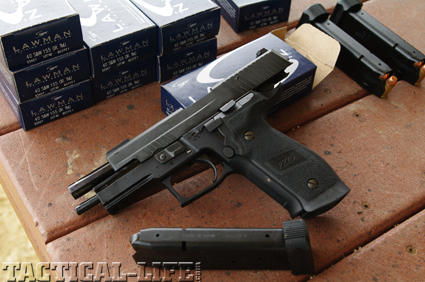 On the pistol range, I found a broad selection of the company’s excellent pistols, ranging from the .40-cal. 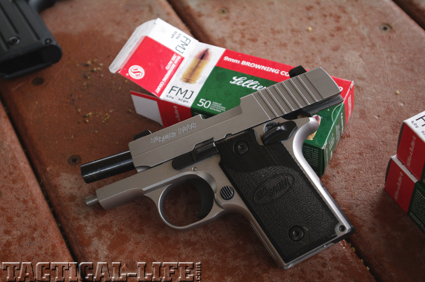 P226 Tactical Operations pistol to the P238 in .380 ACP to the E2 series pistols. I also had an opportunity to try out a P226 Combat TB, fitted out with a Gemtech suppressor. Other samples on the range included the new 1911 Tactical Operations and a suppressed P220 in .45 ACP. 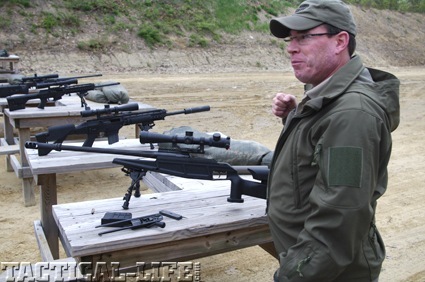 Moving over to the rifle range, we ran in to Dave Grimshaw, rifle product manager. In addition to giving us a very close look at the highly advanced Blaser Tactical 2 straight-pull, multi-caliber rifle, he brought out another truly intriguing rifle. 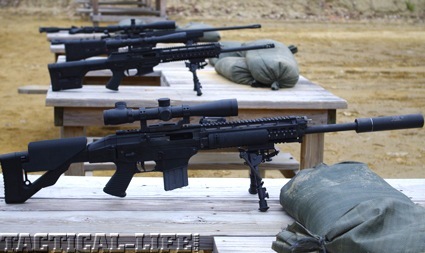 Still in the R&D phase, Dave presented to us a variant of the company’s SIG556 DMR rifle—but with some modifications. Based on the SIG556 DMR rifle in .223, this variant is designed to offer compact yet precise firepower through its folding buttstock with adjustable cheekpiece/comb. Dave gave us a quick overview of the suppressed variant he had out on the line, then let us try it out for ourselves. After a good batch of shooting on the rifle range, we all were gathered up and taken over to another section where Robert Hirt was waiting to give us a presentation on the new SIG516 AR rifle in .223. Robert ran us through the basics of the design, explaining that it is designed to be the next phase of the AR platform, with improved reliability and ergonomics. The core of the system is its pushrod gas system that, opposed to the more traditional DGIS (direct gas impingement system), is claimed to run more reliably and cleaner and cooler. However, Robert knew the best way to prove this was to show us. Using a rifle that was described to us as a being a T&E variant that has fired more than 20,000 rounds so far, he ran five full 30-round magazines full-auto through the rifle and then quenched it in a barrel of water. He then immediately took the rifle out and ran one more magazine full auto with nary a problem. Click over to Page 2 for for more torture testing. 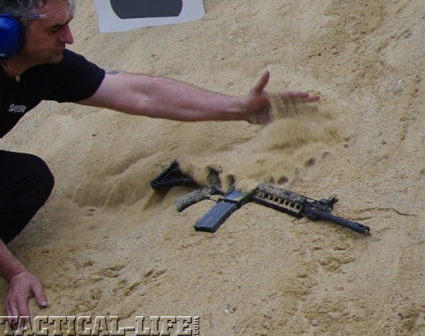 For the next phase, Robert showed us the sand test, where he buried the SIG516 in sand and then ran a full magazine through it. Next, Robert buried the 516 completely under a wall of wet mud in one of the adjacent ponds. After pulling the mud-encased rifle from the pond bed, he moved to the targets, running a full magazine through the rifle full auto, which resulted in a shower of mud on Robert and baked-on dirt on the barrel. 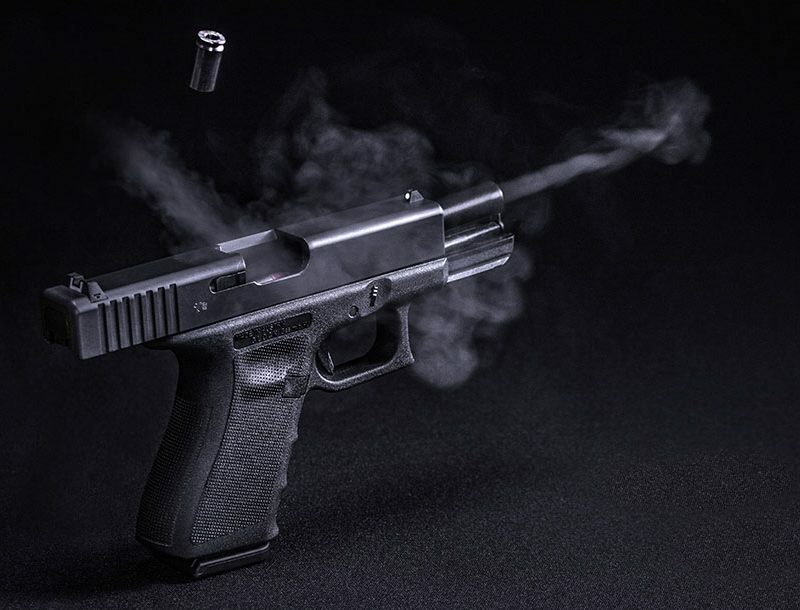 Not content to leave it at that, Robert then dunked the 516 in a barrel of water to clean the mud and dirt and then immediately ran a magazine through it, resulting in a cloud steam emanating from the rifle. However, this was not the end of the test. 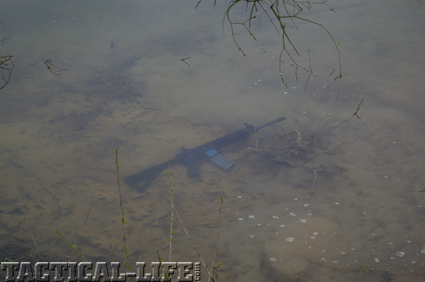 Explaining that for their military customers SIG recognized that the SIG516 must be capable of functioning immediately upon emerging from a body of water, Robert tossed the empty rifle into a pond and let it sit for a moment. After ensuring that all his audience was clear from his intended path, he charged into the water, grabbed the rifle, ran to the targets and proceeded to run a magazine full auto through the rifle without a single malfunction. 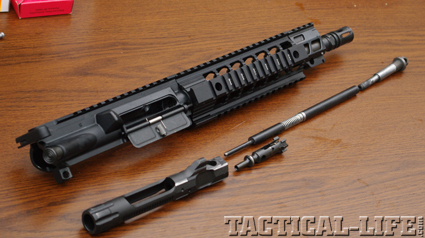 Keep an eye out on Tactical-Life.com and in the pages of Harris’ many print magazines to see reviews of the guns featured here in this piece.